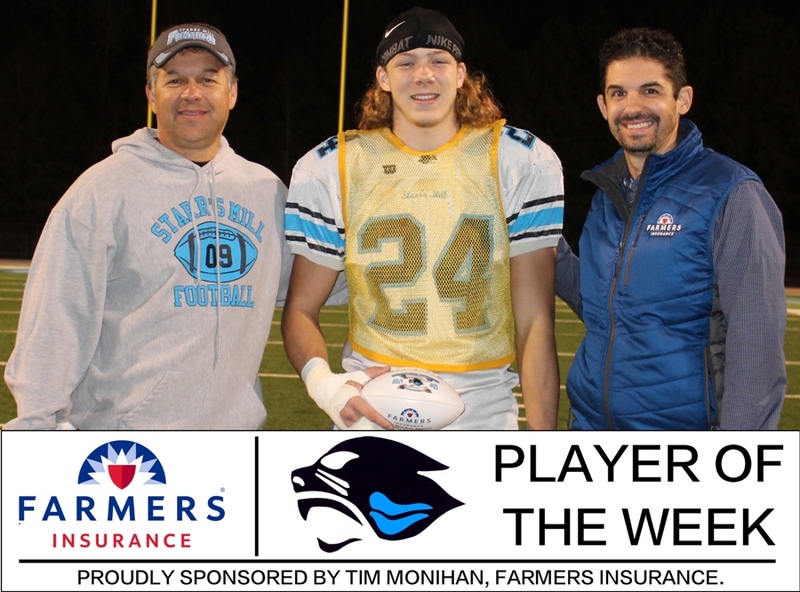 Tuesday evening, Tim Monihan awarded senior Colton Houser with the 11th Farmers Insurance Player of the Week award for the 2017-2018 school year. This is the second time this season Houser has earned the award. Houser runs a Panther defense that has executed 70 tackles for a loss and forced 22 turnovers so far this season. In addition, the defense is only giving up 20.2 points per game. Houser led the defense in last week’s game where the Panthers shut down the Dutchtown offense and blocked a field goal preventing a tie game. Starr’s Mill won 31-28 and moves on to play Bainbridge. Tomorrow night, Starr’s Mill hosts the Bainbridge Bearcats in Panther Stadium. A win will push the team closer to a state title. The game starts at 7:30 p.m.
“Executing [defensive] plays were huge, and we have strong defensive players to do so,” Houser said.